Home Tags Posts tagged with "Farrakhan Twitter Army"
Ebony S. Muhammad (EM): I want to ask you about the prison that you visited. It was your first time speaking in a prison, and you brought The Teachings 2.0 Tour there. Can you share a little bit about that experience? Brother Jesse Muhammad (BJ): Yes ma’am. When I went to Boston they took me inside of two prisons. It was the two prisons that Malcolm X was in before coming out into the Nation [Of Islam]. Yes it was my first time, and it’s not that I haven’t been invited to go in, but I chose to deal with the schools while letting others who usually go into prisons do that. I wanted to work in the schools on the preventive side so that you all wouldn’t have to minister unto them in the prisons. I’ve always focused on schools in the last several years. Going into that prison… man, the Norfolk Federal Pen…You know the walls are so high. We went through, literally, about seven or eight doors before we even got the chance to see the men. It was maximum security. When they say “the belly of the beast”, I really got a chance to see. Interestingly, we didn’t think they would allow me to bring a book in, but they allowed me to bring in The Teachings 2.0 book. They said that’s the only thing they’ll allow me to bring in and I was like, “That’s all I need”. To go in there and see such brothers who are dignified Muslim soldiers… Some of those brothers in there are more solid than some brothers outside the prison. I just went in there and did what I usually do and got on the “witness stand” and bore witness to the Honorable Minister Louis Farrakhan. It wasn’t anything different than what I do at a mosque or in a school. Just testifying. I was talking about the Minister and social media, but come to find out there’s so much advance access for inmates that one of the inmates asked me what was Black Twitter. I was like what in the world, how did he know about that? Some of them have been given iPods and have been able to listen to certain Student Representatives of the Minister like Brother Nuri Muhammad. It’s not like they’re just that shut off. They know some of the things that’s going on. It was such a blessing that our testimony moved some of the men to tears. I did wrestle on the way there when the brother told me that the majority of the brothers I would be talking to have life sentences with no possibility of getting out. How do you inspire a man who, in his mind, doesn’t think he’s getting out of that cage? So I had to make a sincere prayer that it’s not about me. “Allah just use me as you see fit”, and we were blessed to represent the Minister the best we could. One of the deepest things I walked away with from that, Sister Ebony, is that I realized that many of those brothers in prison are more free than some of us that’s outside the prison. Many of those brothers are the epitome of what the Minister told other prisoners when he spoke. He said, “Make the time serve you. You don’t serve the time”. I listened to those brothers, I looked in their eyes. Some of them are at peace. They are free in their minds. They’re operating like they’re not in prison. It was an amazing thing. In 2016 I have to fulfill my word, because at the end one of the brothers asked me, “What took you so long to come into the prisons man?” I told them it was my first time. He was very firm with me. He said, “You’re robbing the brothers on lockdown of a testimony like this. Nah man we need your word that from now on you’re gonna go in these prisons and speak.” So I never forgot that, and I gave them my word so this year, God-willing, I’ll be going into more prisons along with the school so I can keep my word. Boston was definitely one of my favorite visits with The Teachings 2.0 Tour. Student Minister Don and his staff, they took good care of me. I spoke in Providence, Rhode Island. That was the city I think I spoke in about ten times along with interviews, schools and rehab centers. I spoke at a family day in the park. I tell the cities, and I told Student Minister Don this and he took it very seriously, I said I want to be like our Father – and Brother Nuri can attest to this – we don’t go to the city to relax. This is not a vacation. We only want to go to the hotel room when it’s time to go to sleep, so put us to work. Brother Don said, “Okay”. So when I landed in Boston, I literally went from the airport to a place that used to be a cleaners; it’s closed now but they still have this vertical steamer. I took my suit out of my bag, they steamed my suit. I changed in the back, grabbed a smoothie and went straight to speak four times, right after I got off the plane. This was within thirty minutes [of landing]. They said, “Brother Don said to work you, so we gonna work you”. (laughs) That’s The Teachings 2.0 Tour for you. We’ve seen a shift in how the masses use their social media devices where it has become the main source of breaking news, evidence in court cases and protests of all kind. What do you believe caused this shift that some thought would eventually die off, yet, has grown and continues to grow? So if you see us doing the Cali Swag or you see us Dabbin’ at the protests, don’t get upset, don’t get mad at us. If you see them walkin’ it out or whatever it may be. If you see them nay-naying when they get a victory, don’t get mad at this generation. It’s very unique. They’re not reinventing the wheel, they’re just putting some rims on it. That’s why it’s the generation of fulfillment. That’s why they put out a shirt that says, “This is not your grandmother’s civil rights movement”. No disrespect, but even the Minister said that the strategy from back in the day is not for today. That’s why people are so shocked. Then they just automatically think that young people can’t stick to stuff. All of a sudden they have ‘Attention Deficit’ to everything. No, our attention span is not dictated by mainstream media today. 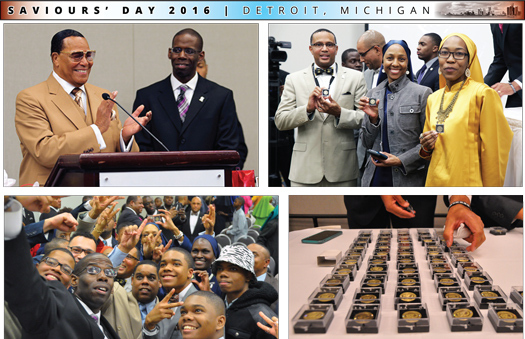 On Friday, February 19, Saviours’ Day 2016 kicked off in a very unforgettable way. While most weren’t anticipating the appearance of the Honorable Minister Louis Farrakhan until Sunday, he literally shocked the entire Nation of Islam, in particular the Farrakhan Twitter Army, by attending and giving the official “State of the Tweet Union” address to the social media soldiers and everyone else in attendance. The ceremony opened with words by Bro. Jesse Muhammad, Farrakhan Twitter Army lead and social media strategist for Min. 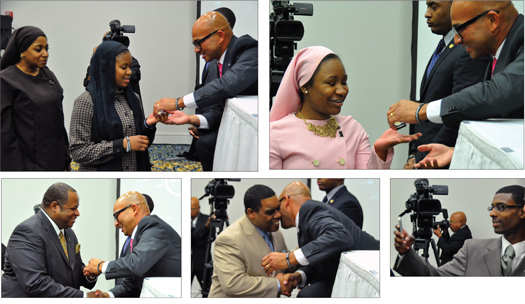 Farrakhan and the Nation of Islam. He thanked the Minister for his 60-plus years of sacrifice as well as Mother Khadijah Farrakhan and the entire Farrakhan family. From there he officially welcomed everyone to the first ever Farrakhan Twitter Army (FTA100) Award Ceremony, recognized the 100 award recipients and thanked those in the room and Twitter soldiers watching live via webcast. Bro. Jesse acknowledged two sisters who each gave their testimony of how the Farrakhan Twitter Army impacted their lives. Nzinga Muhammad from Rochester, N.Y., who was recognized as the top Defender in the Farrakhan Twitter Army, shared how being on social media and defending the Minister gave her a voice and how being on social media can be used in a positive light. Khadijah Muhammad from Memphis has been defending the Minister on the platform Tumblr for five years. She expressed that even on Tumblr people were spreading false information about Min. Farrakhan and the Nation of Islam. The founder of Mosque Flow, Bro. Jeffrey Muhammad of Austin, Tx., and sons Maajid and Ahmad were introduced, who then gave out awards of specially designed lapel pins to each of the #FTA100 honorees. The crowd stood and cheered as each member was gifted and congratulated. Just as the last few honorees were called, in walked the Honorable Minister Louis Farrakhan. 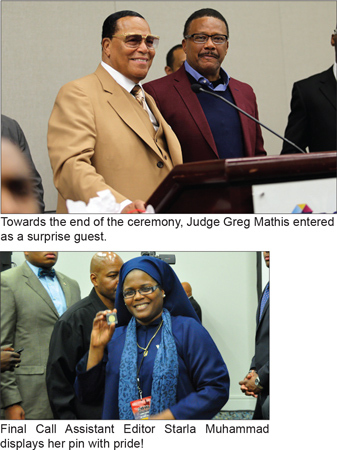 The expression on his face was of great joy to see the Farrakhan Twitter Army members awarded. In his remarks, the Minister acknowledged the great work of the Twitter Army and said he would like the 100 awardees to grow to 10,000. Min. Farrakhan said those in the Twitter Army are his ministers in their ability to engage the public with the Teachings of the Honorable Elijah Muhammad. He said the instrument of the internet allows the Nation to bypass the controlled or mainstream media, which means the controlled media has in essence lost control. On September 9, I was guest on the Ahmad X Morton Show alongside Benton Harbor City Commissioner Marcus Muhammad. In my segment, we discussed The Teachings 2.0 book, the Honorable Minister Louis Farrakhan’s impact on social media, the consistent work of The Farrakhan Twitter Army and much more. Click below to hear the full replay.